One of the most common questions I get is about giving a wedding toast. It is a huge responsibility to give the wedding toast. For most, it is the only speech they will give the entire year, and the stakes are quite high. 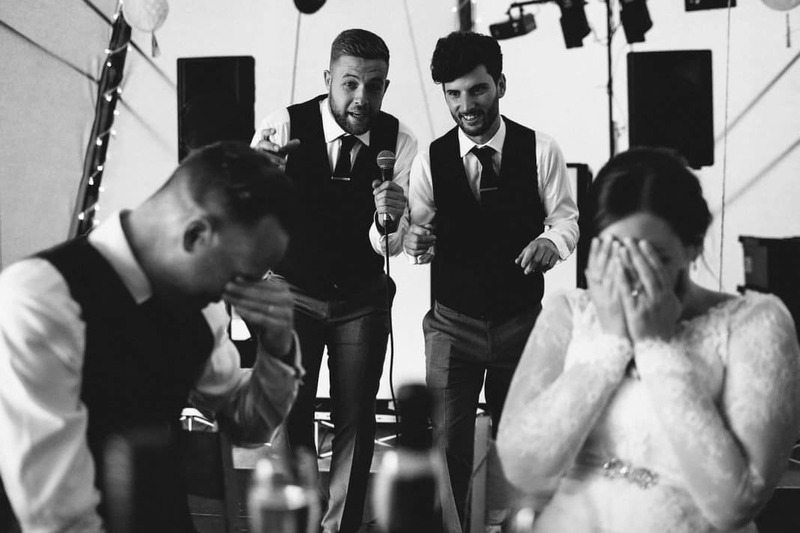 Here is some advice to that will help you impress everyone at the wedding, with your public speaking skills and make a memorable moment for the happy couple. Nobody expects Winston Churchill. Don’t worry about it being perfect. As long as you say the right things, people will forgive most mistakes. Not to mention that the guests probably have pretty low expectations that will be easy to meet. In other words, you will get points for trying hard. Don’t worry about trying to memorize your wedding toast. It’s okay to hold notes, but try not to read the speech either. Use your notes as a reference rather than a script. Reading your speech is boring and doesn’t sound as genuine as speaking from the heart. The template added here relies on personal stories and minimizes the need for memorization. If you’re nervous or anticipate fear or anxiety, check out here for suggestions on dealing with that. I have included a handy infographic to walk you through a great strategy for giving a wedding toast. It has been tried and tested and always works out well. It may look like this is a lot of stuff to say, but keep in mind the whole wedding toast should take about five minutes. You’re probably safe for up to seven minutes, but after that, you’re pushing it. To help you organize your thoughts, print out the included infographics and fill one out with some notes. Most importantly, practice. Practice a lot. Feel free to print these out and use them for notes or practice. Here is a rundown of what to include. Easy guide to writing your wedding toast! If you are feeling fancy, this would be a splendid time to mention how great the bride looks or how lucky the groom is. I would also be sure to extend a hearty “thank you” to whoever it was that paid for the event. That alone will make the speech a success for at least one person. Finally, conclude this first section by proclaiming the wedding a success and fun event. Introduce yourself and describe your relationship with the bride or groom or both. The fact that you are giving a toast reflects your close relationship with the bride or groom, so you don’t need to belabor the point. The second part of your speech is a great opportunity to win the audience over by making them laugh. You should tell a short story about the bride or groom from their past that you were a part of. People love stories, and they especially love personal stories. It’s okay to embarrass the bride or groom a little, but be careful and think about how this story is going to sound in a room full of strangers, children, and Aunt Bessie. If you are okay with the story, and sure the bride and groom can live with it, go for it. From here on out the toast is about, and only about, the newly wedded couple. To make it easy, think of these sections as the story of them consisting of the past, the present and the future. For the past, tell an anecdote about how they met from your perspective. If you were not around to see their budding relationship, talk about when you first learned of their relationship. What did he or she say about their partner? What were first impressions? Keep it light and endearing. In this part, it is traditional to discuss how happy the couple makes each other. Some things to consider might be how you noticed a positive change or maybe a conversation where one of them expressed their love for each other. All day the couple has been showing love for one another, this is a chance for a third party (you) to describe how genuine their love is. The last part of the married couple’s story. What does the future hold? Let me tell you! The future is full of happiness and adventure and commitment. It is not the time to mention the statistics on divorce, or how they hope to overcome any problems. The only thing anyone wants to hear is how they are going to have a great future together. I would avoid mentioning children unless you are sure they’re into that. Conclude this section with good wishes. Remember that this is a wedding toast. If you are not holding a drink, there should be one within arms reach for when you reach this moment. The great thing about toasts is that they are incredibly easy to end. Hold up your glass and say, “Please join me in congratulating <insert names here>! Cheers! (Or whatever is the cultural expression of choice). That’s it! Now you can have a drink and listen to everyone explain how impressed they were with your toast! You may have done so well someone else will ask you to do another one!